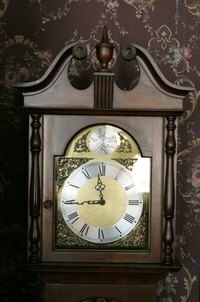 You can make a grandfather clock chime louder by adjusting the chime hammers. If the hammers are not set correctly, they may not be making direct contact with the chime rods, resulting in less sound. Chime hammers are connected to long wire-like arms that are made to be bent. By removing the face of the clock, you can gain access to the hammers to align them with the rods for louder chimes. Open the bottom door of the clock. Reach in and stop the pendulum from moving. Wait until it's completely still and shut the door. Open the door on the face of the clock as far as it will go. Grab the small knob centered on the clock hands and turn it clockwise until it comes off. Pull off both clock hands. Unscrew and remove all the small screws around the perimeter of the faceplate with a screwdriver. Gently pull the faceplate off and set it aside, face up. Look inside the clock. You will see four long arms with four small hammer-shaped heads on both sides of the clock mechanism. You will see four corresponding chime rods descending vertically that these hammers hit. Reach into the clock and grab the hammers one at a time, and push them into the chime rods with your fingertip and hold it there. The tip of the hammer should be dead center on the chime rod. If it is not, push or pull the hammer in the direction needed until the hammer is centered on the chime rod. Check all eight rods and align them, if needed. Put the faceplate back on. Put the hands back on. Shut the door and start the pendulum. You can start your clock up without the faceplate to check your sound and hammer alignment, but it will throw your clock hand movement and chime sequence out of sync unless you get the hands back on in the exact place they were before. It is not recommended unless you are experienced with clock movements.